"Thanks for this dream week in the past and the future of our history and for sharing your knowledge, your simplicity." "Thanks for a fabulous trip through past and future, the discovery of amazing sites and totally outside the traditional tourist sites and my introduction to the knowledge of Ancient Egypt"
"Beyond the mysteries of Ancient Egypt, I have two questions left: -" Where do you find time to do everything? - "When do you sleep?" Thank you for everything and don’t change! " "Thank you again for this wonderful journey that "filled" in the highest sense of the word: Each time more surprising discoveries, and the veils are torn to better understand the past that is still relevant. We can only hope to go forward to other adventures! Sincere friendships." "This trip to Egypt was of an intensity far beyond what I could have imagined, especially as my notions of ancient Egypt were sketchy at first. Gigal, I wanted to thank you from the bottom of my heart for all you gave me, your higher knowledge, the art of looking at things, and especially a very high reflection on the role played by ancient Egypt in time and space. The programmed visits is exciting. It reveals every day a magical and never-ending world to discover. On my part, it gave me the keys needed to understand what has been written in the sacred texts of ancient origins of humanity. How lucky are we to still visit sites not accessible to public. I encourage all those who would want to do this trip, and discover or rediscover Egypt." 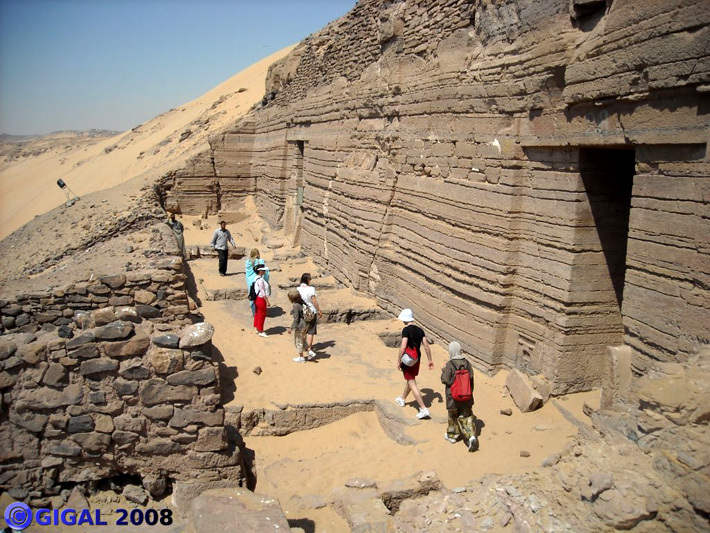 "Truly great kudos to GIGAL who knew how to put our finger on the true nature and dimension of the famous Giza Plateau including the great privilege to visit the site (closed to the public) of the Serapeum underground. At this point, and before these imposing “sarcophagi” we cannot fail to wonder about the origin of humanity and purpose of all this. So I really felt to be a child in the doorway of the stars. An unforgettable trip! " "It's a wonderful week and remember that I just spent, with people all motivated, not only by the same passion for ancient Egypt, but also the search for the Truth on the pyramids and temples of Giza plateau and the huge subterranean network structure it contains. Some few writers such as Guy Claude Mouny accompanied by Guy Gruais, have begun to identify and prove precisely by the geometry "PLAN" and "Space" underground structures of this magnificent plateau. Gigal, through your columns, your work is participating in the same objective: the visible hides the invisible, but for the observant eye, Gigal, you knew the details that, once assembled, provided us with a vision that is both comprehensive and accurate to the reality of the plateau’s underground, while in is differentiated view contrary to that which is conceived, written, spoken and taught by the official Egyptology. You showed us extra - ordinary sites, whose beauty and ingenuity are compelling. I encourage your work of Truth which I bring my full support, in thanking you again very sincerely, these wonderful exchanges and discoveries that made the richness of this trip. May everyone think and reflect every thoughtful and may the truth come out for everybody to see and understand. " "A wonderful trip!! But above all thanks for your presence Gigal, your extraordinary participation, your eternal smile, your generosity, your skills ... No, no, no, it's not too much. Only the exact truth! We wanted to tell you that we are super happy to have met you !" "Going on a trip to the holy and mysterious land of Egypt is a dream that many want to make come true one day ... but visiting this land of Egypt with Gigal is unique and unforgettable because one is opening to inaccessible territories and discoveries: it's like someone inviting you into his house, his intimacy and the secrets of his own home, but also receiving and sharing with her competent and caring being: the very rare presence and knowledge that comes from the heart. A big thank you and happy are those who leave again soon ... "
"Exciting and passionate. Very present and listening to everyone. I will return to Egypt with you as soon as possible, back into the magic of this country to benefit from your knowledge, your vision. Gigal thank you and see you soon." "Thank you for your articles. It is a true work of researcher who must become more like a detective to discover the truth that some people want to keep secret and buried, when they are not simply destroyed! Also thank you for the trip to Egypt and the journey to the center of ourselves, deeply revealing, and the lessons which will bear the fruits for our consciousness, I feel it." "To this day our eyes are still filled with all these wonders and the heart is swollen with a wonderful message. We were in Egypt for the first time, I dreamed of it since childhood. I want you to thank you from the bottom of the heart for this wonderful encounter. In deep gratitude, my mind is still in Egypt and the articles allow me to go further in its history, I am delighted with this discovery and I thank you very much for it." "All your work is important, especially courageous. We are very pleased to provide a tiny fraction of it, if only in thought. Thank you again for what you are, your quality, soul ..... and for this work. " "I would also like to thank you for your passion, your honesty and your dedication .... This trip to Egypt will remain for me a great lesson in life. The work you do contributes to the advancement of mankind, what a great mission, I am very lucky to have crossed your path. Since we came back, I keep thinking about Egypt and I am drawn again and again, as if by an irresistible force ...."
"I thank you for your company during those eight days, great skill and sensitivity. My being was all enriched by this beautiful experience on this" wedge "of Egyptian land! It was my first trip and it was fabulous. Gigal is not only a “well” of knowledge and a great guide but is also responsive to our questions and our impressions. She is passionate about her research, and she is thrilling and exciting to listen to. I hope to go to Egypt again with her." Danielle S., May 2008 "
"I personally came out stronger from this trip out of the ordinary!" "Our heads are full of memories and mystery still unresolved, but one thing is for certain: it comes from another time. A big kiss to you, and a thousand thanks for all you did for us to open some doors. " "Twice we have discovered with you an Egypt-very different from the one we traveled as a tourist. With your strong team we have found among many things: the oddities in the buildings ... including the pyramid of Cheops, the Egyptian soil pierced with square holes forming wells for ventilation, subterranean networks carved in the rock... and so many other things contrary to what has been said or written for thousands of years. You have made us heat of Egypt to make dreams *... Pharaonic ... It is clear we will return to Egypt with you to find the passion you taught us and continue to accompany you in your research. TS subscribers since day one, the articles of GIGAL are the exact reflection of what we have seen together. "